LTC3636 and LTC3636-1 are high efficiency, 4 MHz synchronous dual output buck regulators that incorporate a constant frequency/controlled on-time, current mode control scheme with phase lockable switching frequency. Their design architecture reduces conducted and radiated emissions. The devices can deliver up to 6A of continuous output current from each channel or generate a 2-phase single output up to 12A. The parts accommodate output voltages as low as 0.6V from a 4 x 5 mm QFN package. The switching frequency is user programmable from 500 kHz to 4 MHz, enabling the use of tiny, low cost capacitors and inductors, and also may be synchronized to an external clock signal. 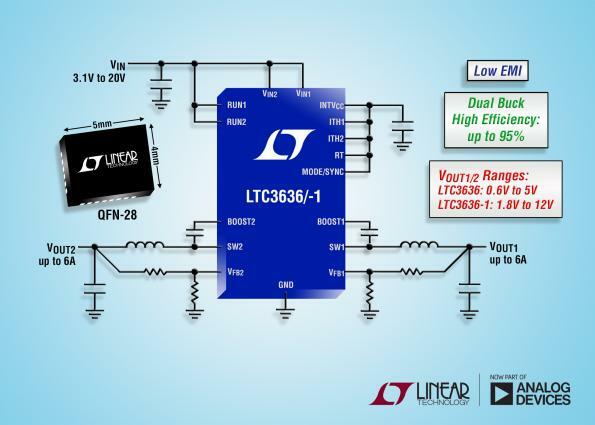 The LTC3636/-1 both operate from an input voltage of 3.1V to 20V, while output voltage sense ranges are 0.6V to 5V for the LTC3636 and 1.8V to 12V for the LTC3636-1, for dual-cell Li-Ion applications as well as 5V and 12V intermediate bus systems. Each channel of the LTC3636/-1 uses internal switches with R DS (ON) of 32 mΩ and 18 mΩ to deliver efficiencies as high as 95%. Its control architecture enables it to achieve duty cycles as low as 5% while maintaining switching frequencies up to 2.25 MHz, for high step-down ratio applications such as 12 VIN to 1.8 VOUT conversions. The two channels run 180 degrees out-of-phase, minimizing the size of both input and output capacitance. The dual outputs may be combined in a 2-phase configuration for up to 12A output current. Burst Mode operation is used to maximize light load efficiency, requiring 600 µA at no load.